Campbell, Leroy, and H. Gute. “The Bas-Reliefs.” In _The Excavations at Dura-Europos Conducted by Yale University and the French Academy of Inscriptions and Letters: Preliminary Report on the Seventh and Eighth Seasons of Work, 1933–1934 and 1934–1935_, pp. 91-94, pl. XXIX.1. Ed. Michael I. Rostovtzeff, Frank E. Brown, and C. Bradford Welles (New Haven, Conn.: Yale University Press, 1936). Rostovtzeff, Michael I., and Franz Cumont. “Interpretation of the Reliefs.” In _The Excavations at Dura-Europos Conducted by Yale University and the French Academy of Inscriptions and Letters: Preliminary Report on the Seventh and Eighth Seasons of Work, 1933–1934 and 1934–1935_, pp. 100-101. Ed. Michael I. Rostovtzeff, Frank E. Brown, and C. Bradford Welles (New Haven, Conn.: Yale University Press, 1936). Torrey, C. “The Dedicatory Inscriptions.” In _The Excavations at Dura-Europos Conducted by Yale University and the French Academy of Inscriptions and Letters: Preliminary Report on the Seventh and Eighth Seasons of Work, 1933–1934 and 1934–1935_, pp. 83-89. Ed. Michael I. Rostovtzeff, Frank E. Brown, and C. Bradford Welles (New Haven, Conn.: Yale University Press, 1936). du Mesnil du Buisson, R. _Inventaire des inscriptions palmyréniennes de Doura Europos (32 avant J.-C. a 256 après J.-C.)_ (Paris: Geuthner, 1939), no. 19, pp. 11-12. Perkins, Ann. _The Art of Dura-Europos_ (Oxford: Clarendon Press, 1973), pp. 84-88, pl. 34. Cumont, Franz. 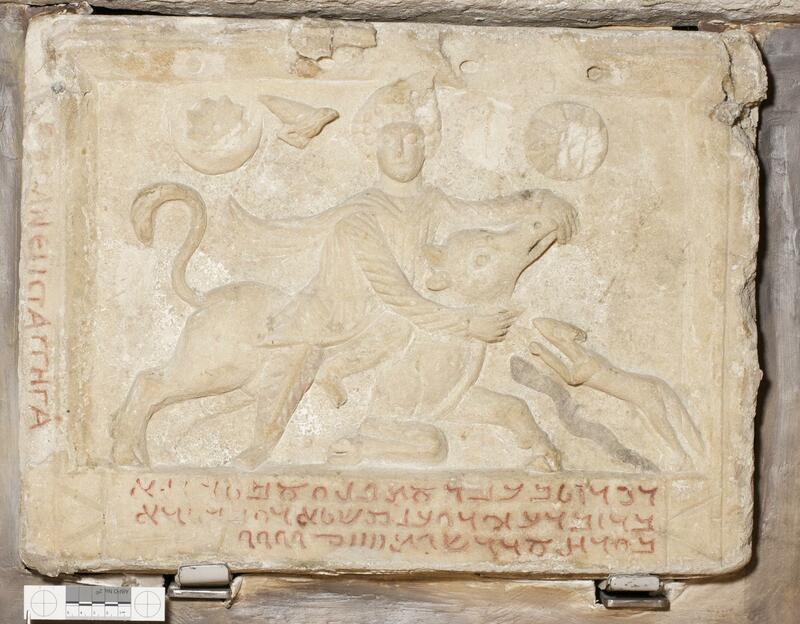 “The Dura Mithraeum.” In _Mithraic Studies_. Ed. John R. Hinnells, pp. 165-169. 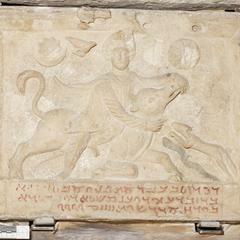 Manchester: Proceedings of the First International Congress of Mithraic Studies. Manchester, Eng. : Manchester University Press; Totowa, N.J.: Rowman and Littlefield, 1975. Downey, Susan B. _The Stone and Plaster Sculpture. Excavations at Dura-Europos. Final Report III, Part I, Fasc 2_ (Los Angeles: Institute of Archaeology, University of California, 1977), no. 7, pp. 22-25. Mathiesen, H. _Sculpture in the Parthian Empire: A Study in Chronology_, vol. 2 (Aarhus: Aarhus University, 1992), no. 172, fig. 52, pp. 196-197.